If you’ve been following this blog (or another fine blog I know called Chasing Mailboxes) you’ll know that PBP training is in high gear. Randonneurs across the country, including Felkerino and me, have been heading out regularly to put in miles for the main event. It’s been a fun summer of riding our brains out. This past weekend our friend Lane, Felkerino, and I packed on the miles. Saturday we traversed 176 miles and Sunday’s total came out to 146, for a total of 322 miles over the two days. This is Felkerino’s and my final big ride before PBP next month. Felkerino and I used this route, originally cued by Lynn K. and Crista B., last year to prepare for Tom Rosenbauer’s Endless Mountains 1000K so we had a good idea of what we were in for in terms of terrain. 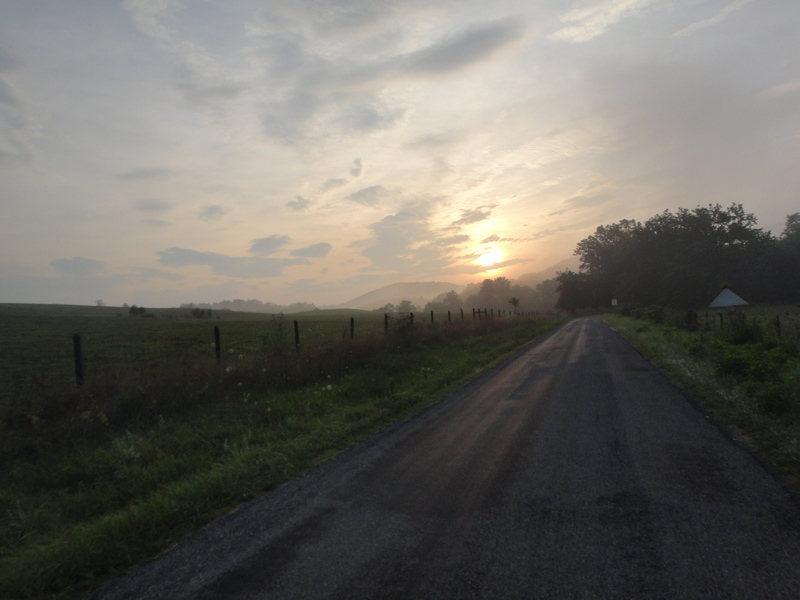 Day One includes a mellow start that starts to get choppy as you ride to the century mark in Crozet, Virginia. Then there is a lovely stop at Chiles Peach Orchard, where you can savor a peach and kiss the good times goodbye. 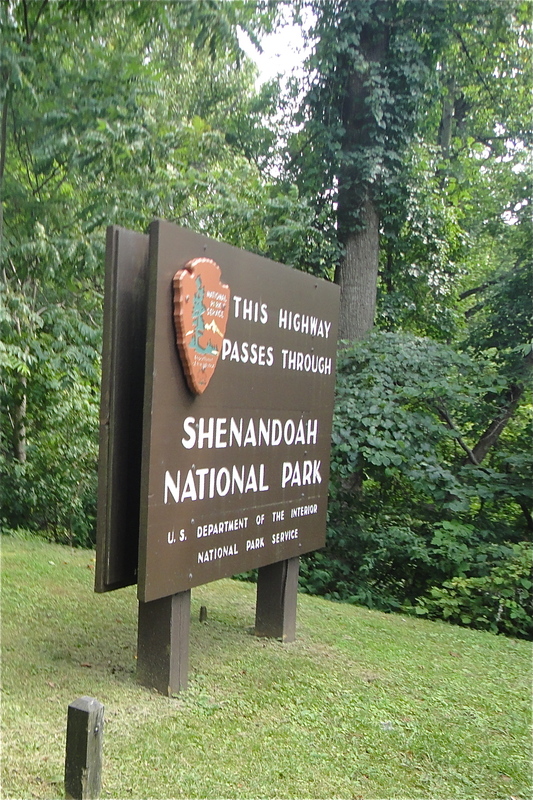 The next 16 miles are a climbfest on the Bikecentennial Route past the Cookie Lady up to the Blue Ridge Parkway, 16 miles on the Parkway, a mighty descent off of the Parkway, and then rolling terrain into Lexington. 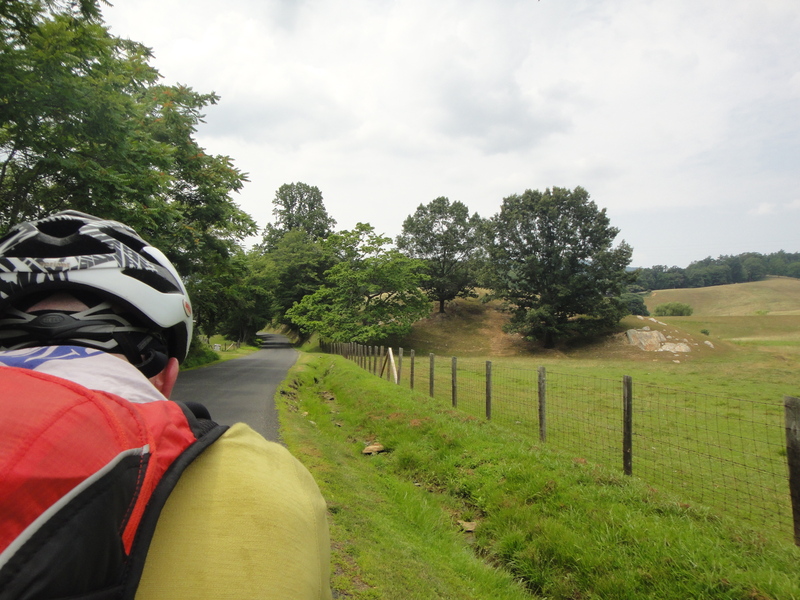 Day Two starts out with a climb to Rockbridge Baths, some more steep rollers through stunning terrain, a mellow section along Route 11, and then a climbfest over Massanutten Mountain and Thornton Gap. 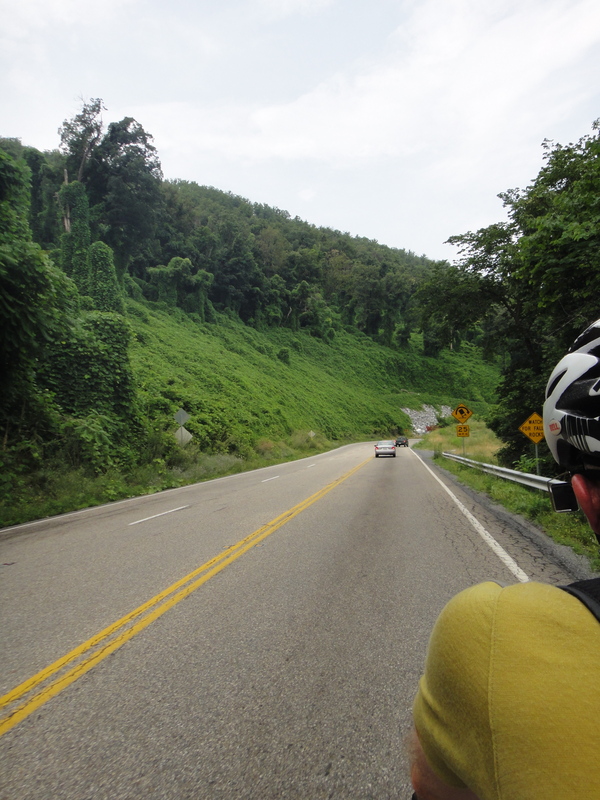 After descending Thornton Gap, we zip by Sperryville, Little Washington, and go bouncing along on the rollers back to Warrenton, Virginia. Proximity. Warrenton, an hour’s drive from D.C., makes it a fairly easy drive from home. High-mileage days. We wanted to build our mileage base to prepare for the big day. Discomfort. Putting in two days like this is not a nonstop party. This may sound strange, but for me it’s an important reminder that a 1200K requires some uncivilized behavior, including getting up and riding earlier than I want, intense saddle time, some physical discomfort, and some low moments where I really wonder why I thought this was a good idea in the first place. Great scenery. My description of our route cannot do it justice. While this is a tough course terrain-wise, it is not overly punishing (most of the time, anyway), with many visually stunning parts along the way. A good, but manageable, challenge. This weekend’s ride did have its challenges. Did you go outside at all? It was hot, particularly on Saturday, with temps hitting 100 degrees. I felt a little daunted by the forecast, but at the same time I was hungry to do the ride and we rode this course last year in similar weather. Our riding posse decided we would just pace ourselves appropriately and stay hydrated. Ultimately, we ended up taking long breaks during the hottest times of the day, which stretched our riding time out. 100 degrees. No wonder my face is so red! Both Lane and Felkerino and I got flats after passing through a patch of glass. This happened just as we were making our final trudge up Route 250 to the Blue Ridge Parkway. Fortunately, we were able to find a spot to pull over and have a brief flat flxing fest. We also got caught in a thunderstorm after climbing to Humpback Rocks. That was pretty exciting. 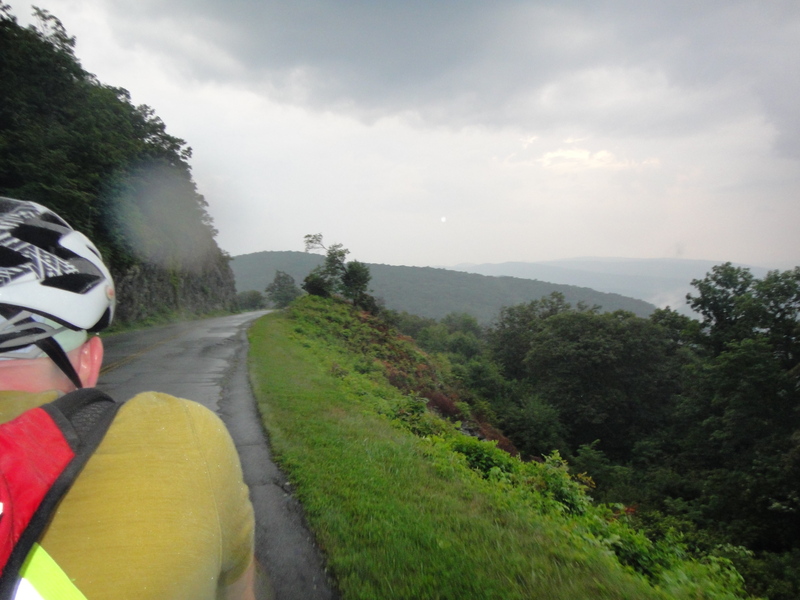 The Parkway was eerily quiet, except for the thunderclaps and rain hitting the road. Oh, and did I mention the lightning? Yeah, that was rather scary, particularly because there is really nowhere to shelter on the Parkway. It made the views even more dramatic, though, and the storm helped me find new energy in my legs. Lane, Ed, and I worked our way as quickly as possible along that segment. The story of the second day was all the deer. We saw a TON of deer on the second day. Most would see us and run off, but there was one deer couple that decided that instead of running away from us, they would try an innovative tactic and sprint straight at us. Fortunately, we were a fair distance away from them, saw them gazing intently at us trying to decide their next move, and we stopped. Having never seen deer be aggressive or whatever it was they were doing (sprinting over to give us a hug?, steal our money? ), I was a little taken aback. We also enjoyed lots of cloud cover and more manageable temps on Sunday’s ride. 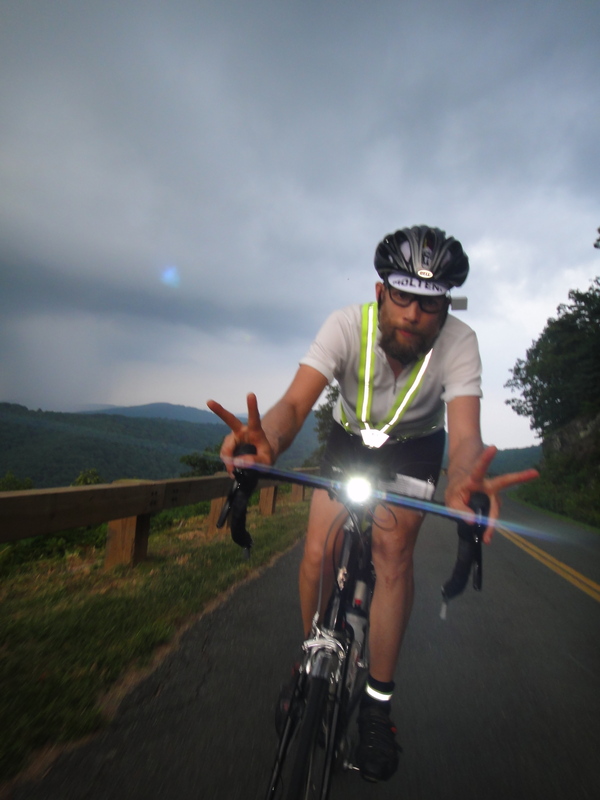 The sun decided to reappear just as we made the turn for the Massanutten and Thorton Gap climbs (how does that work, I ask you?). While descending Thornton Gap we felt the heat begin to billow up. For whatever reason, the other side of the mountain ridge was significantly cooler than the eastern side. Being from Iowa, a rather flat state, I find the power of the ridges to influence weather quite amazing. 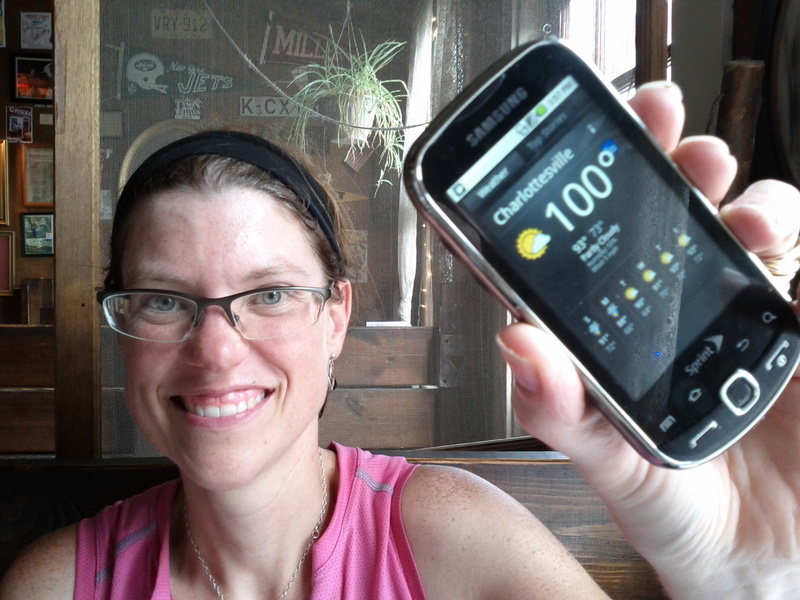 It was a toasty 30 miles back to Warrenton and then it was done. The 320-mile fun ride was over. We burned our disgusting clothes in the park and drove home. Just kidding! First, we talked intensely about how gross they were and then we put them in plastic bags to deal with later. Summer riding can be such a sweatfest! More pics of the adventure are here. So that’s it, folks! We’re all geared up for PBP. Yes, even Lane is in PBP shape, though he isn’t going. Insert sad face here. I cannot wait to meet so many other randonneurs and be part of this historic event. Thanks for following along on the blog, and please say hi if you see us out and about in France.